Poll: Have you or will you attend an event with the pope? Pope Francis will leave Ireland later today. 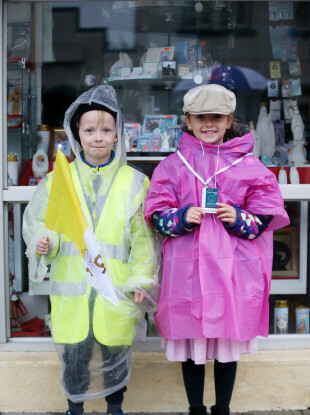 Paddy (6) and Molly Hunt (8) from Co Mayo waiting to see the pope at Knock Shrine this morning. POPE FRANCIS IS on the second day of his two-day visit to Ireland. Hundreds of thousands of people are expected to attend events with the pope this weekend, with the largest crowd due at a Mass in Dublin’s Phoenix Park this afternoon. Stand for Truth, a demonstration in solidarity with Church abuse survivors, is due to take place at 3pm in Dublin city centre to coincide with the Mass. Yesterday, Pope Francis met eight survivors of clerical, religious and institutional abuse. Let us know: Have you or will you attend an event with the pope? Email “Poll: Have you or will you attend an event with the pope? ”. Feedback on “Poll: Have you or will you attend an event with the pope? ”.